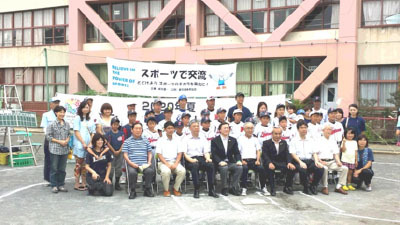 Higashi Yamoto City, Tokyo: Junior baseball players of Ishinomaki City, Miyagi Prefecture in Tohoku, were invited to Tokyo on July 21, 2014 to learn basic skills from Masahiro Nojima, a 1996 Atlanta Olympic member, currently works with Japan’s largest oil company, JX-Eneos. Nojima told kids his experience how wonderful it was to play baseball at the Olympic, encouraged to set a dream, answered questions and took pictures with them to the delight of the youngsters. The event was a part of Tokyo’s drive to help Tohoku region’s recovery for the devastating 2011 earthquake and tsunami, and show its restorations to the world at the 2020 Olympic. This is being done by support through sports, sending athletes to the disaster-stricken areas, sports exchanges between the children of the affected areas and Tokyo. 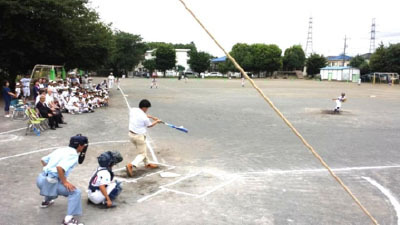 The Bureau of Tokyo 2020 Olympic and Paralympic Preparation and Tokyo Sports Association plan similar baseball events for 5 times by the end of August and a large number of Olympians of baseball will be invited to join the program.